A past guest of Impala Lodge will be unsurprised to see it featured as ‘Chalet of the Month’. This private retreat, nestled snuggly on the edge of Meribel in the small hamlet of Gittaz, is the very definition of tranquillity. It is fairly easy to convey the character or essence of this chalet in few words: quiet, gentle seclusion with a dedication to comfort. Chalet Impala Lodge offers views of the valley that are nothing short of breathtaking; even relative to other chalets in comparable locations, this lodge will genuinely captivate you. The dining room’s expansive windows look out onto the rolling folds of the valley, while the deck offers an almost overwhelming vantage point from which to take in the majestic landscape. During the summer, the deck of Impala Lodge is absolutely unparalleled as a place to unwind with a few drinks, while winter brings a potentially more dramatic view but temperatures less amenable to outdoor drinking. All four floors of this stunning building have been recently refurbished and refitted to the highest standards of luxury and style. The size of this lodge makes it ideal for families or large groups of friends wanting to holiday together, but without living on top of each other! The seven spacious bedrooms all have en-suite shower rooms, two of which are equipped with baths. Families and couples can therefore relax into their alpine retreat without worrying about encroaching on each other’s privacy. At Impala Lodge, being in the next room can feel like you are a million miles away. All of the chalet’s have been elegantly designed; the entire layout somehow strikes a perfect balance between spacious and cozy. This is truer of the living room than of anywhere else. Simply walking into this room for the first time forces most guests to stop and admire the beauty of their home for the next week or so. The fireplace dominates, as one would rightly expect from an alpine idyll, and it is surrounded by couches that compel you to recline. The lofty ceilings make sure that you never feel stuffy, but the warm décor, light wood tones, and crackling fire on a cold evening will ensure that you never want to leave. Of course, as with all chalets in this area, it is the services that truly make it what it is. In this regard, Chalet Impala Lodge is a cut above. Seven nights’ accommodation includes a champagne reception, a daily breakfast and afternoon tea service, followed by an amazing four course evening meal prepared in your kitchen by talented chefs. As if this wasn’t enough to help you embrace a decadent week of indulgence, the chalet comes fully stocked with carefully selected wines, beers and soft drinks. A daily housekeeping service will take any day-to-day chores out of your hands, leaving you free to enjoy the slopes, the town, or your incredibly beautiful holiday retreat. If you do wish to venture out (nobody could blame you for having a day indoors at Impala Lodge) the chalet includes an in-resort chauffeur service, which runs until 10pm. What we can learn from Tignes’ Avalanche? 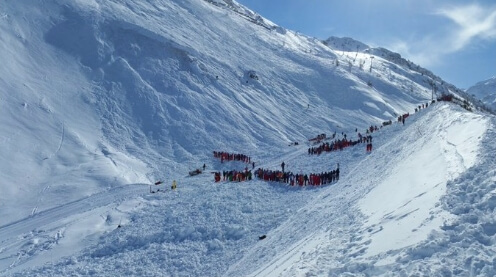 Today we have heard from local police that there has been a fatal avalanche in the ski resort of Tignes. At the time of writing 4 skiers have been confirmed dead with another 5 buried. First off I just wanted to say my thoughts are with them and wish the buried skiers all the luck. 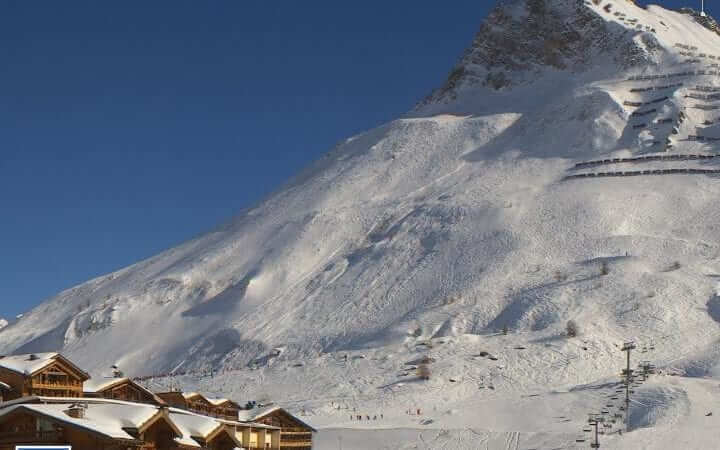 This is the biggest avalanche this season in Tignes but the shocking truth is that avalanches happen every day. Most are very small and do not involve holidaymakers, thankfully. This is mainly down to the brilliant work the piste safety staff perform every day. So what has made me put pen to paper, if you will, about this avalanche? As with most accidents we can learn from others mistakes or bad luck. Skiing or Snowboarding like many other sports can be dangerous, it is something you should understand when you click into your bindings each morning. For most on-piste holiday skiers this could mean a bruise or broken bones at worse, but, for off-piste skiers, there is a lot more at risk. This avalanche stood out to me more than most and it has a few areas which we can learn from, this is what I would like to discuss here. A group of 8 holidaymakers hired a mountain guide to take them off-piste skiing. It was reported that all 9 skiers were swept away in the 400 meter wide avalanche. Sadly 4 skiers died whilst 5 more are buried. At this very early stage, it is not known how close the skiers were to each other at the time, the size of the avalanche was quite wide so might not make a difference anyway. Was it safe to go off-piste? Now that is a question! It is never safe to go off-piste skiing just levels of how risky it is that an avalanche could happen. Most ski resorts use a flag and/or number system which is controlled by the local piste authority who continuously monitor pistes and adjacent slopes for likelihood of slides. They could change the flag/number at any point in the day, it is something that all off-piste skiers should know about and monitor. Most resorts use a scale of 1-5 (numbers) which shows how risky it is, 1 being low and 5 meaning stay on piste! Today the avalanche risk was 3 out of 5. I can’t speak for anyone else but I would consider this an acceptable level of risk if I was skiing off-piste. So I (you might not agree) think the conditions looked ok to ski off-piste. What else could make a difference? The 8 skiers were bright enough to hire a local mountain guide, this is something I can not stress the importance of. Unless you are one of the few people who grew up and have lived in the resort all your life and know the area as good as a mountain guide, you should always hire a local guide if you intend on going off the beaten track. From what I have seen and the reports I have read it looked like a perfect day to go off-piste skiing, a clear blue sky. There is a big caveat here, the weather for that time is not the only consideration under the ‘Weather’ heading. I don’t at this moment know the temperatures and history of snow fall on that slope which are areas that investigators will need to look into at a later date. So the weather looked ok too. How did the avalanche happen? Well, this is very early days here and I can only guess from what I have read and know of the area. So, please, this is just what I think at this moment what could have happened. The reports from eye witnesses say that the avalanche was triggered by another set of skiers higher up the slope. Why did the Ski Instructors stop all ski lessons? Ski resorts have well-drilled emergency procedures, they practise before the season starts as well as throughout the season. Some resorts sound a siren alerting of an avalanche, some use radios to communicate the emergency. Ski areas are vast and quite simply there isn’t enough lift attendants and emergency ski patrollers to cover the area within the time needed to help skiers in trouble. Additionally often, like this avalanche, it covers a lot of ground so you need as many people as possible to help find the buried skiers. Therefore when the alarm is sounded all ski instructors no matter what they are doing drop everything and go to help. They have all been trained and know what they need to do. This is why ski lessons were cancelled. The conditions looked very good and the group hired a local mountain guide, however as much preparation for your days skiing and the amount of knowledge the mountain guide has, there are always other skiers around. A big no no for off-piste skiing is to ski above another group of skiers lower down the slope who are not in a safe position. Did the other group just see the guide group and thought ‘if they can ski there it must be safe’? Or was the group led by another mountain guide and something just went wrong? What we do know is that in the time I that it took for me to have written this post the chances of the buried skiers being found alive (if they have not been found already) are very slim, it would be a miracle. The first 15mins of an avalanche is the most important, speed is everything. A very common thought in skiing is that ‘it must be safe as those skiers skied it’, I can not stress how wrong that is. If there is one thing to take away and remember from this article or today’s sad event, please please don’t think this. If you found this helpful and worthwhile sharing, please do. We have social media buttons on the left which will help. Thank you. The 2015-16 FIS Alpine Skiing World Cup is the 50th edition of the prestigious competition and having begun back on the 24th October, we are now very much entering the business end of the season. Between now and the seasonal finale events in Saint Moritz on 20th March, all of the top titles will be decided and this brief re-cap should get you right up to date in time for the final twists and turns of the campaign. So far in the men’s Alpine Skiing World Cup, there have been 35 of a scheduled 44 events completed and those races have delivered a huge amount of drama and no little heartbreak for some of the skiers. The early part of the season was dominated by Austrian Marcel Hirscher and Norwegian Axsel Lund Svindal, who between them took nine victories from the first 11 events. Other competitors were still hot on their heels however, but the chase of one such rival was ended on the 19th December during the downhill event at Val Gardena in Italy. That competitor was none other than Austrian Olympic champion Matthias Mayer who suffered a season-ending fracture of his sixth and seventh thoracic vertebra after a severe crash. As testament to his dedication and toughness, Mayer is still hopeful of a return to top class action in time for the 2017 season but his serious injury was by no means the end of the drama in the current campaign. Just three days after Mayer’s injury, compatriot Hircher’s own season could easily have been ended in the most bizarre of fashions. Whilst completing his slalom run at Madonna di Campiglio, the Austrian was nearly struck by a camera drone which crashed after broadcasters lost control. Fortunately Hirscher was not injured and even managed to still finish second in the event but the crash did unsurprisingly lead to the camera drones being banned by the FIS. Hirscher’s narrow escape seemingly left the season as a three-way battle for supremacy between himself, Lund Svindal and fellow Norwegian Henrik Kristoffersen. That trio tragically became a duo however, after Lund Svindal – the overall World Cup leader at the time – crashed out during a downhill run at Kitzbuhel on 23rd January. The Norwegian needed immediate knee surgery and after his and a number of other serious crashes, the event was abandoned with only 30 skiers having left the gate. As things stand therefore, the overall World Cup title seems to be a straight fight between Hirscher and Kristoffersen, who has a total of 283 points to make up on his rival across nine events if he is to come out on top. The 2015-16 women’s Alpine Skiing World Cup has delivered loads of excitement and drama through the first 32 of its 40 scheduled events, despite the beginning of the campaign being most notable for those skiers not present at the start gate. Last season’s top two Anna Kenninger and Tina Maze had announced before the season began that they would not compete and American legend Lindsey Vonn’s rehab from an injury that ended her 2014-15 season also removed her from the first two months of this campaign. It was Vonn’s compatriot Mikaela Shiffrin who took early advantage of the absence of that trio and recorded two victories and a second place in the first four events. Shiffrin’s own season however, was interrupted in mid-December by a serious injury following a crash during practice for an event in Are, Sweden. The injury would put Shiffrin out for a full two months during the heart of the season, and would open the door for the returning Vonn and Swiss skier Lara Gut to move toward the top of the rankings. 14 victories shared between that pair so far this season has seen them pull out close to a 300 point lead over all other competitors at the top of the overall World Cup rankings, with just eight events still to go. The most notable amongst those victories however, has to be Vonn’s success in Zauchensee, Austria on the 9th January. That win saw the American match the all-time record of 36 downhill World Cup victories and her two subsequent wins this season in the discipline mean that she is now out on her own with a total of 38 to date. In spite of her record breaking exploits though, Vonn by no means has the 2016 overall World Cup title sewn up, with Gut sitting only 28 points behind the current leader ahead of trips to Jasna, Lenzerheide and then Saint Moritz. The conclusion to the season then, should be a high octane and high drama affair that will likely come down to the final weekend in Switzerland on the 19th and 20th March. Welcome to our last episode for this week leading up to half term week in Meribel. We hope you have enjoyed our focus for the run up to the busiest week of the season in Meribel. If you missed yesterday’s or in fact the whole weeks worth of our reports you can find them HERE. The forecast for today suggested that the morning would be the best time for visibility as more snow is expected in the afternoon. However even before first lifts the snow was already falling and the cloud had come in. Visibility wasn’t great. If you have never been to Meribel before then we have some good news for you, there are lots of trees. Although very beautiful and make the whole area stunning, to a skier this means something completely different. Skiing in or near trees breaks up the cloud and makes the visibility much better, a handy thing to remember in a white out or fog! We skied all over the valley today, up high to down low and although the cloud was thicker at the top there wasn’t a huge difference. The snow is actually very good, the resort does a good job of looking after the pistes. With the new fresh stuff falling, next week should be very nice! Keep an eye out on the weather forecast and get out there early when the blue sky’s back. The 3 Valleys have a great App, it includes a piste map and live stats on which lifts are open. We highly recommend you download to your smartphone. I have had a great week reporting back to you all about the snow conditions as well as my drinking schedule (although I don’t think my boss had that in mind) for the week. I’m not leaving Meribel as my ‘normal’ job of customer services for the SkiGB.com network (which includes MeribelGB.com) is based here. If you see me in my SkiGB.com jacket say Hi! Before I go, we did finish the day in the Folie Douce and I can confirm alcohol was consumed! It’s our second to last posting session for this week, welcome to day 5 of our silly but factual build up to half term week here in Meribel. The forecast for today looked stunning, the typical bluebird day with little to no wind so an early start was needed to attack the hill and make squiggles in the snow. There is something really nice and calming in ski resorts just before the lifts open and Meribel isn’t any different. It wasn’t too busy either, the main traffic on foot or skis were seasonal workers heading for work. We decided that we wanted to go up high right away and get the big slopes before they got tracked out, so big = Grand which must mean we should ski the Grand Couloirs for the first run of the day. But don’t worry we did our stretches and warm up exercises beforehand. Guess what? We had first tracks! In fact our first tracks stayed there on their own for a number of hours so we didn’t need to hurry in the end, oh well. Next we skipped up to Mont Vallon where it was a little tracked from yesterday but still plenty to keep us happy. Then my favourite, under the Cote Brune lift. If you like skiing powder get there quick as the guys from Val Thorens will also be heading there. A quick lunch then we just hit the pistes hard, the snow is great, very grippy and a dusting of powder (or POW if you are younger than 20 years old) if you want to play. It was only lower down that the pistes got a little icy in shadows and where ski schools had scraped the nice snow off. More snow is heading our way too so it is looking really good for next week! It started to get a little cloudy around 3pm so the light got a bit flat, I don’t care though as it was blue sky for the most of the day. We finished off as per normal with a couple of drinks to celebrate the days events. Tomorrow being our last post for the lead up to half term we are going to do something extra cool! Welcome to day 4 of this week’s run up to half term Meribel focus. I’m sorry we are posting this a little later today, there is a very reason and i would just like to say it wasn’t my fault! More on that later on. Some days when you are on the snow it reminds you why you put up with the bad ski days, today was one of those. Where we saw rain yesterday today was completely different. With the recent snow fall over night the snow conditions have gone from a soggy sloppy mess to bright white fluffy powder. If you can imagine white candy floss spread over a beautiful landscape, today was a GOOD day! Most of the day though the cloud hung around which at times made the light flat, but every so often the Sun came out and lit up the mountain to give you a perfect view. Through-out the day it snowed steadily, not too much to stop you seeing but enough to make a difference under the ski. It was best to keep low and near the trees as higher up it got a little foggy. Queue were low today and once again the slopes were not too busy so looking after the snow for next week. The forecast for tomorrow looks like a day you would miss your best friends wedding for, after all no friends on a powder day! Now back to the reason this post is a little late. I was very happily skiing alone with some friends and they DRAGGED me kicking and screaming to Ront Point (bar on piste) and forced a brownish cold liquid down my throat several times over! I highly recommend you don’t do this as it makes your eye sight blurry and you become wobbly, not fun! Day 3 of our Meribel Focus! Welcome to day 3 of our lead up to half term in Meribel, the centre of the 3 Valleys. Before we start the report of Meribel for today we have had a few mentions on Facebook and Twitter that we seem to end up in bars regularly. I think it is important to provide a good cross section of information about Meribel, whether it is the snow condition, news about queues, weather or beer. Tough job this isn’t it! Today’s report is dominated by wind, no nothing to do with the beans I had for breakfast and the beer last night. This is the type of wind that closes lifts, a lot of lifts! The Meribel resort information screens pretty much just say ‘Stay in your Valley as you might not make it back’. I am assuming they mean make it back to the Meribel valley rather than never coming back ever again?? There really wasn’t any point of this sign really as they had closed all the lifts that reached the top of all the peaks anyway. We have come to the conclusion that there must be a black hole in Meribel which transports people to another dimension or somewhere. Upon arrival at the ski lifts in Meribel centre this morning there were only three lifts working, each of these lifts had queues longer than half a dozen football pitches, it wasn’t the best site in the world! But the funny thing was though once you get up the hill all those people just simply disappeared, the pistes were once again (like yesterday) just mine. Maybe there is a run I don’t know about which everyone wanted to ski? We think that is unlikely because that just doesn’t make sense so it just must be a black hole! Time for some good news i think, the snow in the morning even half way up the hill was pretty good, I really enjoyed skiing it. If you are heading out next week you will too! These focus reports are not going to sugar coat the conditions, if you are of a weak disposition you might want to read the rest of this behind your sofa! After midday the conditions turned from ‘not great’ to ‘worse than not great’. The snow started to get slushy, yes slushy! However I actually like skiing in slush, it’s just wet powder isn’t it? It wasn’t all bad, at least it wasn’t raining! Around 13:00 it started to rain. Damn! With more lifts closing and bars getting fuller by the minute we decided to call it a day and go home for a nice cup of tea. It’s day 2 of our Meribel and the 3 Valleys build up to half term focus. The weather forecast looked like it would be one of those days where in the evening beforehand you mutter the words ‘no more beer for me it’s a powder day tomorrow’! So up nice an early to make first tracks in the ‘powder’ raring to go. You’re probably thinking I’m going to write something like ‘what powder?’ or ‘i really should have had that extra beer last night as today’s snow is pants’! But NO! Not only was powder present it was there with much of its friends. Don’t get me wrong it wasn’t deep enough to flow over your head and can’t breath. But there was best part of a foot of light fluffy heaven so all was good. Right so on to the weather and snow conditions, quite the mixed bag today and like a good horror film it doesn’t have a happy ending! But before that, lets start with the weather in Meribel first thing. As mentioned above we were expecting a nice sunny day but it was quite cloudy, i always think if you are going to give us a cloudy day with flat light you might as well snow too! Still hit the slopes feeling fresh and by 10:30 the Sun made an appearance, it pushed away all the clouds and showed Meribel in all its snowy glory! We skied to Courchevel yesterday (see yesterday’s post) so we thought we would go the other way to report back on how Val Thorens was doing. Big crowds hanging around the resort of Val Thorens as if they were waiting for someone to shout ‘GO!’ before they were allowed to venture further. I didn’t wait for the green light and skipped around the resort testing their powder and creating pretty lines. Around 13:00 the wind started to show its hand and the flags at the 360 bar (I wasn’t drinking honestly!) were as solid as if they were placed in the North Pole. We decided to get back to the Meribel valley. If you remember one thing about these little posts it should be this: in the 3 valleys when the wind comes lift start to close down, get in your valley! It was quite lucky too as wouldn’t you believe it the lifts started to close. All day the pistes were empty, at times we had them to ourselves. It was if this was the first or last week of the season, where were all the skiers?? We skied on down the Mottaret around 14:00 for a bite to eat, and WOW! I have lived in the 3 valleys for over 5 years and I have never seen so many people queuing for the three main lifts in Mottaret. Imagine all the skiers from Courchevel AND all the skiers from Val Thorens all in one place trying to get home and you would be spot on! That is exactly what was happening! There were some very worried looking faces in the queues. However on the up side the taxi drivers face had big grins! Next week is the BIG week for us Brits who go skiing with their family, half term. We thought we would mark this important week with a run up of the conditions in the 3 Valleys to get you all excited to come out. Last year we did this for Val Thorens so to mix it up this year we will do it for Meribel, i guess it is the ‘British’ resort of the 3 Valleys so quite fitting. First thing the Sun was out AND the hat was on, well for a while. By about 11am the clouds got a little bit moody, although it didn’t actually snow of any worthwhile amount, there were some angry looking clouds looking for a fight! By about lunch time the cloud started to show what they were made of and the fluffy white stuff we all love began to fall. Visibility reduced also to about 50m up high but further around resort level. We nipped over to the Courchevel valley to check, well firstly that it was still there (you never know!) and to see if we could see better. We couldn’t, so back to Meribel. Some of the higher lifts were closed, we think due to high winds but it didn’t seem windy enough to close a ski lift. Being a sceptic I think they are saving the snow for you lucky people! By about 3pm the snow was falling quite heavy, a good 6 inches worth I would say in a couple of hours. The queues were ok through-out the day, first thing was busy in Meribel centre, as per norm. The snow is actually very good, forget the doom and gloom you read in the papers, i skied a foot of powder today many many times. Didn’t need to tour for 2 hours to find it either, lucky really as the off-piste is not too safe at the moment (be careful kids!). In fact just off the piste there were plenty of places to bounce like a bunny, ideal if you want to learn powder skiing in safety. Val Thorens ski resort has announced that they will be opening the resort 1 week later than planned. Due to a shortfall of snow that the Alps has received it was the only option to delay the opening date by a week. Val Thorens will now open on 28th November. We have seen the resort open a little later in previous seasons which for those times was the correct decision. Looking at the current snow on the ground and what is forecast we think this is the only option too. If you have booked a trip out to Val Thorens for the first week we recommend that you speak to your tour operator. If anything changes on this news and opening dates we will keep you informed, and, of course, we will be keeping an eye on the snow as it falls too! Another season ends here in the centre of the 3 valleys ski resorts, the home from home also known as little UK, Meribel. We have had a ball this season with some great snow, at times. It wasn’t the greatest season ever with bad snow at the start of the season meaning we had to climb to get to the powder, however there was never a day we couldn’t ski, even if for just one run! The Meribel ski resort have lots of plans in place to improve the resort, we also have lots of new things to include next season. Our new website is coming along nicely which will offer so much more than our current one. We hope to see you back next season! Do you want to be kept informed about the latest news and gossip from the 3 Valleys? Then sign up to our new SkiMail starting in the lead up to next ski season. If you would like to be kept informed of the off-season work in resort don’t forget to follow our main Facebook, Google+ and Twitter pages. So until next season have a good summer! The 2014/15 ski season is coming to an end, only Val Thorens is still left open. It has been another fun season and it was great to meet so many SkiGB.com readers! There have been highs and lows this season, shall we will start with the lows. The start of the season took a little while until the snow arrived for some of the 3 valleys ski resorts, Meribel and Courchevel in particular. This meant many skiers headed up higher to Val Thorens to find snow. Due to the changes in temperature and large dumps of snow some weeks were very dangerous off piste. It was very sad to hear of several skiers and snowboarders getting caught up in High avalanches risks. It is a stark reminder that the mountains need respect. Some of the resorts got blocked by rock falls so travelling to and from the resorts had some very long delays. However there haven’t been not too many negatives. I am not going to be able to list all of them here as there are too many but here are just a few. Snow, boy did we have some great snow all over the 3 Valleys. When the big dumps came they came big! This season we celebrated lots, Meribel hosting the Alpine Skiing World Cup Finals, Les Menuires reaching the grand old age of 50 years old and the many Courchevel international fireworks and parties put on by the resorts and local businesses, thank you all! Almost all of the ski resorts had improvements on previous seasons, whether new ski lifts, new car parks, new bars (our favourite) or new pistes, the ski resorts have once again spent a lot of money ensuring the 3 valley ski resorts are the best in the world. The resorts have also won some more awards, Val Thorens winning the Worlds Best Ski Resort for the second year in a row to name one of many. We have some more Michelin stars arrive in the 3 Valleys making the area a place to visit just to eat! We could go on and was very tempted to do so but you would probably get bored reading this especially if you didn’t make it out this season. There are lots of changes planned for next season which we will write about soon so come back! SkiGB.com will also be having a make over through-out the summer where there will be new sections of the ski bringing lots of new functionality. We will be letting you know about this nearer the time. Don’t forget to sign up to our new newsletter so you will be informed on what is being improved and upgraded over the summer in the 3 valleys. Additionally we will be on Twitter, Google+ and Facebook if you would like to join in with our discussions about the ski resorts of the 3 valleys. Reports are coming in that 4 snowboarders have been caught up in an avalanche roughly 1 hour ago (11:30 local time) in the Orelle ski area. Early reports are saying that there are no major injuries with one snowboarder with a minor injury. The rescue helicopter was use to locate and evacuate the snowboarders to safety. The snowboarders were trapped by a rock but unfortunately one of the snowboarders got swept away. He was quickly found by pisteurs and has been taken to Grenoble Hospital for treatment. Additionally to the four snowboarders being caught there was a second avalanche close by which involved a party of 4 skiers. One of the skiers had to be revived and is suffering with hypothermia. A Courchevel mountain guide who was near by came to help, sadly he too is in a serious condition and has also been taken to Grenoble Hospital for treatment. He is also in a serious condition. Just a reminder that off-piste at the moment can be unsafe in areas due to the large amount of recent snow. The area in question for this avalanche is in red below. Road to Val Thorens blocked by Rock! The authorities think the road will now be open at 17:30 both directions. The RD117 road up from Moutiers to Les Menuires and Val Thorens is still currently shut. A diverted route is in place using the RD96 village road. This road is very thin in places so trucks and buses are not allowed. The RD117 road is still due to open at 18:00 with priority traffic given to vehicles leaving resorts. The buses from the connecting trains will also be given priority. It is still recommended not to join the traffic to try and clmb the mountain road until tomorrow. More information here or on our social media accounts once we know more. The very earliest that the road will be passable is 18:00 however there are many vehicles wishing to travel up and down the road so there will be a large delay. The authorities are still working on removing the large rock from blocking the road up to Val Thorens. They have informed us that this will take all day to do and the road is closed to all traffic. It is advised to change your travel plans if you were planning on driving up or down the road until tomorrow. Reports are coming in of a very large rock which has fallen on the main road to Val Thorens. It has broken up the road which will take a while to repair. As you can see by the photo the rock is very large, it is thought to be as much as 50 tonnes in weight, we have been informed that no vehicles were hit by the rock. Tomorrow of course is the main day of the week for transfers of holidaymakers which would see this road very busy, at the moment buses can not pass. There is only one main road up to Val Thorens, however there are old village roads which loop the main road which will help divert traffic. These roads are quite thin so trucks and buses are unlikely to fit down them. What’s new in Meribel and what’s planned? You may or may not, depending on how much of a skiing fan you are, know about the big changes that are afoot in the Trois Vallées. This huge area which includes the very best of the European ski resorts including Meribel, Courchevel and Val Thorens is the largest in the world but the last thing the powers that be want to do is rest on their laurels; they want to keep their place at the top of the tree, or mountain. Meribel has brought even more fame to the area by being the first French ski resort ever to be chosen to host the Alpine World Cup Finals in 2015. This prestigious event which is what every professional skier aims to take part in during their long and gruelling season has put Meribel well and truly in the spotlight across the globe. Millions of viewers are expected to tune into Eurosport to see the often death defying exploits by virtuosos of the piste. One of the best known skiing areas of Meribel is Mottaret and it is here the biggest changes are being made. Over €60m are being invested in the area between now and 2022 and when completed its fair to say that the Trois Vallées will be leaving the rest of the world trailing even further behind. So what are these big changes? The first one is the creation of a new area dedicated to beginners which is directly adjacent to the resort itself. Over the next 2 years the Mont de Challe area right next to Meribel will be completely transformed with a brand new chairlift, a green piste for beginners, floodlighting and a sled zone. Both the Table Verte and Arolles chairlifts will be disappearing from the landscape forever and be replaced by the very latest Combes chairlift which serves the entire area. This new lift will have a station mid way to allow beginners to disembark at the top of their new green run. The toboggan run is bound to be hugely successful as those who want their thrills in another way will be able to hurtle around the track without the edge of danger which is always present for the serious skier. Night time skiing is coming to Meribel thanks to the planned floodlights, so Après-ski, for some anyway, in the resort may actually be skiing! The last change to Mont de Challe will be the creation of an entire new beginners zone that will be equipped with both a draglift and magic carpet lift. There are more major improvements planned for the Mottaret ski area which haven’t been revealed yet. Hervé Lenoire is the director of S3V, the premier ski lift company, and he has spoken about the €60m investment being made with understandable enthusiasm. Some of the planned changes we do know about is the modernisation and renovation of the Chalets Gondola which will take place in 2016/17. The replacement of the double Roc de Tougne draglifts with a new and much faster chairlift will also be taking place in time for the 2016/17 season. Renowned snow artist Simon Beck paid a visit to Val Thorens on Saturday and created one of his master pieces on the side of one of one of the pistes. Simon Beck is an English man who spends a lot of his time in the Alps creating many different types of snow art. This week he created a rose in Val Thorens for all to enjoy. Simon makes his art by using snow-shoes and walks out the design in the snow, often you can only see the whole of the picture from a distance so it must be hard to not to make a mess! Simon started work on this creation at 8am and finished around 2pm and is about 100m in diameter. Hopefully nobody wanted to land their plane in Val Thorens because the Val Thorens airfield was the location! If you would like to know more about Simon here is his Facebook Page. Michelin Star awarded restaurants are considered the best restaurants in the world. Starting with the first star ranging up to three stars for the best of the best. If you are not aware of Michelin Stars they are the restaurant equivalent of the hotel star ratings system. To get a single Michelin Star you have to be an amazing chef, and be a little lucky too! Each year the judges incognito visit the restaurants that either already have a star or are looking to get one to check the quality of their dishes. If the quality of the food isn’t good enough on that visit, tough! This ensures the chefs have to produce this high quality food all the time. So you can see Michelin Stars are hard to get. To get one star is extremely good, two stars you are in the top few percentage of chefs in the world and three stars you are basically a god in the kitchen. There are only 609 chefs in the world who have a star for 2015 which is 1 less than 2014. If you have been awarded with a star you might only get to keep it for one year, if the food isn’t up to scratch on the next visit by the judges they can take the star away again. The 3 Valleys is very fortunate to have some Michelin Stars already and as of yesterday our local restaurants have plenty to be proud of! After they collect all the judges results they produce a directory of all the restaurants that have a Michelin Star, this is the first time anyone is told who has a star for the coming year. This includes the chefs! La Bouitte in Saint-Martin-de-Belleville picked up its third star! There were only two new three star chefs in the world! The Ekrin in Meribel secured its first star. The Epicurean in Val Thorens also picked up its first star. Sadly the restaurant Le Strato in Courchevel loses two stars but we are sure they will get them back as the place is great! With the recent large snow fall over the Alps it has put a lot smiles on a lot of skiers, however with such a large amount of snow falling in such a sort time frame there is sadly a high risk of avalanches. At the time of writing this (2nd February) there have been 49 deaths due to avalanches in the Alps this season. This might sound a lot, well that is because it is a lot! It’s only the start of February and there have been 49 deaths, this is far more than recent years. On the 31st January there were 8 fatalities in 4 separate avalanches. So why are we seeing so many avalanches and more importantly why are we seeing so many deaths? When the large amount of snow fell the snow it didn’t have a good anchor for it to join too. When nice fluffy snow crystals fall onto compressed snow or no snow at all they don’t tend to connect well. Imagine trying to tongue and groove a basketball with a hedgehog, it’s just not going to work! Throw in a change of temperature and some wind and you have a very unstable layer. From what we have read most of the avalanches were started by skiers or snowboarders themselves. I’m sure anyone reading this who skis off-piste has seen a stunning untracked slope which would be the best vertical you would have ever skied. But for safety have decided not to ski it. Sadly it looks like some of the deaths were due to just that, but the draw of the powder was just too much or they simply didn’t think it was dangerous. Other avalanches look to have been started by a group of skiers, it is often the case that the first couple of the group down are OK but others in the group were just too much for the slab and set off the avalanche. It’s quite dangerous off-piste at the moment all across the Alps. In Meribel a 35 year old man is currently missing who was last seen near the top of the Olympic chair lift. The rescue team are still looking for him, we hope he doesn’t join the statistics and is found safe and sound. We have spoken to local mountain guides and rescue services and they are strongly recommending not to go off piste. PS: Sadly since starting this post we have heard of two further avalanches in Tignes close to the piste which were started by off piste skiers. We are not sure if anyone has been caught up in them.